Through the many years, I have had opportunities to swim and enjoy an abundant array of swimming holes. Some merely creeks while others vast spots in the ocean. Although of all places I have swam, one place always comes back to being my favorite spot. A place one could swing from the rope tied to a large Cypress tree, jumped from the sides of cliffs into the chilling waters or relaxed in an inter tube on a hot summer day. This would be Edge Falls which someday, I hope to return an once more relive those great adventures. I first went to Edge Falls as a young boy around 10 or 11 years old. My parents wanting to get out of the house on a Saturday afternoon decided to take me and my little brother Jimmy to the Falls. My two older brothers both who drove camped there the night before. At the time, it seem so far away from our home as my Dad drove along the narrow country roads off the course of civilization. 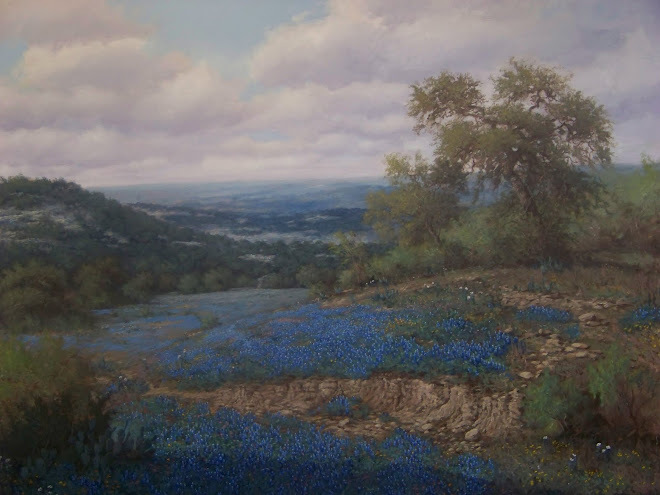 After about an hour drive north from San Antonio, my dad located the entry being nothing more than a rusted cattle guard gate and barbed wire fence in the immense thicket of Cedar and Oak trees. The entry road nothing more than two dirt ruts and some guy sitting on the tail gate of his pick-up truck collecting a few bucks per car load to allow us to enter. The parking lot was a simple field of cut grass about half a mile from the gate where one could see a hundred cars already parked, I spotted my older brother's car already parked in the field. The typical push and shove between my little brother and myself on who spotted the cars first, became the quick scolding from our mom to behave or we would be going home. Jimmy and I were told to help carry the metal Ice Chest while my parents grabbed other items including the fold out chairs for a family picnic. The trail from the field led us into the mast of trees which we hiked down until coming to a large edge of rocks and a huge steel stairwell the went down to the natural pool of water below. Here standing at the top of the stairwell you could observe a beautiful water fall surrounded by the carved out structure of limestone that likely took thousands of years to cut away forming the pulchritudinous view. At the time, the history of the falls had merely no meaning to me. My desire was just to get wet and get to swimming. The surrounding of canyon walls provided a nice field of shade which we set up the chairs for my parents. Placing the remaining items on the ground before we quickly removed our t-shirts running out to jump into the water. The water fall fell from about 30 feet over the natural pool of water with a cliff to one side being about 45 feet from it's ledge while the other side nearly 80 feet as you could hike further over above some shallow rocks below. Older boys were jumping from the cliffs. Some doing spectacular dives while many others would ride the pushing water through the fall. Many of the teens would create the human chain sitting up stream with groups of people behind each other placing their feet forward for the person in front to hold onto while rushing down the natural slide form of the water fall. This was a natural water park long before any entrepreneur would invest in the liking of such things. My little brother racing to climb the rocks to get to the falls first made it necessary for me to beat him and be first to ride the fall. Looking up at the fall, it didn't seem very high from below although once at the top, the view seem much more different. Jimmy managed to slide into the water first and through an array of carved limestone cuts, the water took him for a ride of howling shriek as he disappeared over the edge. I loosing out on being first, maneuvered over the rocks to the lower of two cliffs. Pride getting the best of me, I would be first to jump the cliff since Jimmy was already first to go off the water fall. I carefully climbed out on the ledge that over looked below. The height seem much different as I saw my little brother now swimming far below. After a few deep breaths and two older guys running past me diving off yelling on their way down, it was time to take the leap. What seem to last for so long was just a flash of a second before entering into the huge pool. Wow.....that was awesome. A rush I had never felt before. It wasn't but another minute it seemed that I would be racing back to the top to do it again. An again. An again. Soon, I was doing the back flip and half gainer. Jimmy would have to take his place as he didn't jump from the cliff but continue to ride the water fall. Each time, going past our parents asking, "Did you see me." Each time being warn to be careful and stay off the larger cliff. Surely my mom was a wreak of worry watching her two younger sons who barely swam coming over the edge of the rocks falling to the water below. We would return to Edge falls a few more times. Each time growing a tad older and taking note to the surroundings. By the time I was a older teenager, I was diving the higher cliffs but becoming disappointed with the way the area was becoming a litter infestation of beer bottles and trash. All signs that showed a lack of human respect to the natural shine once cherished by native Indians of this central Texas hideaway. The owners of the property would locked their gate and close it to the public forever more. 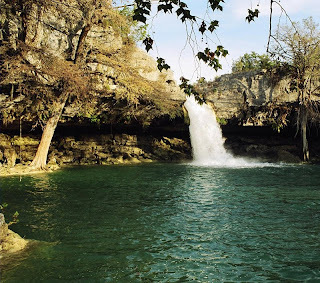 Edge Falls, named after settler George Edge, who established a homestead near the falls, is located on Curry Creek near Kendalia in Kendall County, Texas. This is just north of San Antonio about 30 miles. The property had been privately own swimming hole that the owners allowed the public access since the 1930's. Though by the late 60's began being trashed by visitors and campers that the Edge family closed the property. It would eventually be sold where two Houston doctor's own it today. Although they had closed the property to the public, I would once more get to explored the old water fall. Again, with my little brother Jimmy, and friends; Sherry, Gary Smith and Jesse Alvarez. It had been just after a good rain which always increased the velocity of the water which always made riding the cut stone a greater thrill. We could not locate the original gate entry so we parked further down the road where I knew the creek fed the falls. We hiked our way back towards the property. I was able to locate the cabin that had been resident for caretakers for the many years prior to closing and spoke with a former family member Richard Edge. He seem to like us as we seemed perhaps harmless. 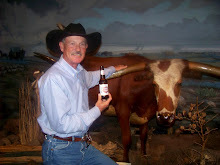 Maybe it was because I alos was wearing a cowboy hat as Mr. Edge was too. Either way, he agree to allow us to swim providing we didn't leave any trash and carried everything we bring in, out. At the time, I didn't know much about the owners or history of the Edge family who owned the large estate. This would be in the late 1970's and that day would be a joy of reliving the good old times swinging from the heavy rope tied in the Cypress tree. Diving from the cliffs up above and rocketing through the water fall to the deep pool below. The place was cleaned up with little signs of trash. Although still some graffiti remain under the many ledges from past visitors. I was able to locate what appeared as an authentic Indian drawing likely 200 years old still tucked away behind the falls from someone who once like myself enjoyed this serenity. Over the years, I would hear stories and rumors about the place. Stories about how bikers and hippies trashed the place so bad that the owners had no choice but close up. Others rumors were about some kid from California visiting Texas jumped off the cliff landing on the rocks below. Even stories about many trespassers being arrested. I even recall hearing quotes "If I ever win the lotto, I'm gonna buy Edge Falls." Many local folks desire the state of Texas to take the property to make it a state park. Regardless that it is privately own. Although, while I miss the great swimming hole, I would hate to see it abuse again. Perhaps one day I'll return to my favorite watering hole. Maybe ask the new owners or care taker to allow me to view the place as I once did years ago. Although, as likely with the changing times and age, the many unnecessary law suits and encroaching residences that now have sprung up near the marvelous place, I too would likely be told "NO" and sent away. I suppose that might just be a good thing too, if that is what would be needed to protect the great swimming hole of EDGE FALLS.